Full disclosure: I’ve been meaning to review this book for some time, but I’ve been too busy with my own enterprise content strategy projects. My efforts would have gone smoother if I had read this book first. 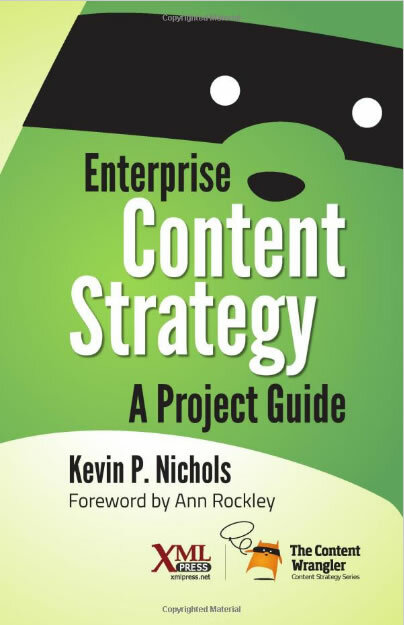 With Enterprise Content Strategy: A Project Guide, Kevin P. Nichols turns his years of leading content strategy teams and projects into practical, detailed advice. Nichols is the author (with Donald Chestnut) of UX Strategy for Dummies, and for more than five years he served as director and global practice lead for content strategy at SapientNitro. At numerous events and conferences, Nichols has shared his experience and interest in topics such as omnichannel and performance-driven content strategy. Nichols has been practicing and perfecting his craft for years, and he crams a great amount of content expertise into this deceptively small book. The page count is small, but the content strategy ideas are plentiful. Nichols likes lists, and he packs his book with sequences of questions and considerations that content strategists need to ask and be aware of, whether they work in a large enterprise or a small agency. Early in the book, Nichols defines enterprise content strategy and how it “envelops all proprietary and intellectual property across an organization’s operational infrastructure.” A thorough enterprise content strategy includes every delivery method, every content interaction, and every integration point. Perhaps the most powerful of these factors is governance. In the following pages, Nichols presents his content strategy project lifecycle, the nine steps that should be part of most content projects. The content project lifecycle is similar to some presentations of a product lifecycle, but at its core sits governance, the organizing, supportive force that helps keep the other steps – and the people taking those steps – moving forward. Throughout these chapters, Nichols offers how-to insights from someone who has clearly been in the trenches. He knows the questions to ask. He knows who you might need to collaborate with. He knows the many details that need to be considered for a thoughtful, effective strategy. For example, in the Define Phase chapter, Nichols discusses how to create a content strategy framework after doing a thorough audit. In a sample framework, he asks many of the questions content strategists need to ask during this phase. It seems as if just answering those questions will result in a worthwhile framework. As if. Despite the advice and encouragement, Nichols never shies away from the reality that doing content strategy in an enterprise is challenging work. It might have been nice to see more specific examples of this throughout the book, but perhaps Nichols’ agency work keeps him from sharing those too revealing case studies. It would also be helpful to see even deeper explorations of certain topics, such as omnichannel content delivery. On that note, Nichols simply states, “I plan to continue to evolve the theme of omnichannel content strategy.” Perhaps some of that thinking can be included in a future edition of this book. Admittedly, this book is a project guide, and Nichols acknowledges that he doesn’t intend to discuss exhaustively all the topics he raises. In many cases, he mentions other books that focus on certain topics in greater detail, such as Ann Rockley and Charles Cooper’s Managing Enterprise Content and Rahel Bailie and Noz Urbina’s Content Strategy: Connecting the Dots Between Business, Brand, and Benefits. Nichols’ book deserves a place among such work. With its sharp focus on using content to achieve positive business results, this little guide is packed with enterprise-tested ideas that most content strategists can learn from and start applying now. Heroic content: Disney is one of a number of southland entertainment companies that base their success on quality content. This morning, when Disney Chief Executive Officer Robert Iger announced another quarter of growth for his company, he gave a whole lot of credit to some things we care about – Star Wars, Marvel’s The Avengers: Age of Ultron (didn’t you love the robots’ debate about chaos, order, and the fate of humanity? ), and content. Since the film industry started, Los Angeles has been a content town. Content is big. And big business. In trailers and studios and soundstages, people ask certain kinds of content strategy questions all the time. Should our megastudio produce this sequel? Should we bring back this sitcom for another season? How do we promote it on the web? That last question is often where we come in, with our focus on web and mobile content experiences. Our questions are generally different from our film and media partners, but our focus on content is no less intense. When we talk about content strategy with the southland’s media companies, we may need to remind ourselves that “content strategy” for them might have a more entertainment-industry focus. We might have to reposition some discussions to veer toward technology and database structure and user experience. It’s not a new direction for these media companies. Tech companies from up north (Yahoo!, Google, Netflix, etc.) have been playing with L.A. media companies for years. And, in addition to expensive outbound advertising, studios devote considerable resources to websites, social media, content marketing. Disney itself completed its acquisition of Maker Studios about a year ago. And the studios are keeping an eye on other southland content creators, such as Snapchat, Whisper, Scopely, and more – as competitors and potential partners. Entertainment content will continue to expand to more screens and devices, so the need for strategists to manage that content and the communications about it will increase. Hollywood: It’s a great place to promote the practice of content strategy.